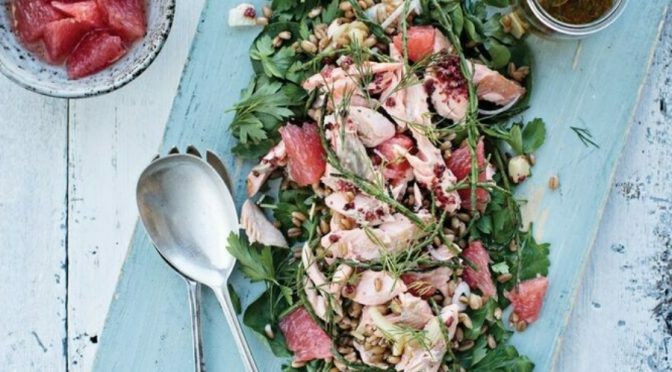 This fabulous looking Goatsbridge trout and spelt berry salad with tangy grapefruit and herb dressing was given to us by Aoife Carrigy, an editor and freelance journalist specialising in food, wine and travel. 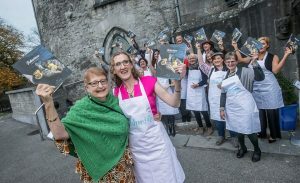 She is Chairperson of the Irish Food Writers’ Guild and a regular contributor to publications including Food & Wine Magazine, CARA, The Irish Independent and Image Interiors. 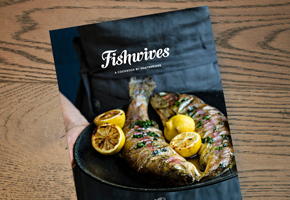 You can find Aoife’s original version on page 38 of Fishwives, along with 77 more fish and trout recipes in a cookbook by Goatsbridge, where all the profits from the sale of the book will be going to an amazing charity called Hospice Africa Uganda. available from select bookstores or online. Soak the spelt berries overnight in water. Drain and rinse and simmer for one hour or until cooked (soft but with a pleasantly chewy bite). Drain and allow to cool before placing in a large salad bowl. In a large hot pan over a medium heat, gently soften the cubed fennel in several tablespoons of olive oil. Once soft and lightly browned, remove the fennel from the oil and drain on kitchen paper. Add the fish fillets, flesh-side-down and cook for a minute before turning to cook skin-side-down for 4-5 minutes or until the skin is crispy and the flesh almost cooked through. Once the fish is cooked, allow to cool slightly skin-side-down on some kitchen paper. Meanwhile, prepare the other elements of the salad. Finely slice shallots and place in a small bowl with the vinegar to soften. Rinse the samphire and steam for 3-4 minutes or until lightly cooked. Cool in cold water and set aside. To segment the grapefruit, run a sharp knife around the inside of each half and to loosen each segment before scooping out with a spoon and into the large salad bowl with the spelt. Remove the shallot from the vinegar and toss into the salad bowl with the fennel cubes. Mix the remaining vinegar with two parts olive oil into a dressing, add the finely chopped dill, season with sea salt and crushed pink peppercorns and sharpen with lemon juice to taste. Dress the salad lightly with some of the dressing, reserving at least half of it. Top the salad with the cooked samphire, watercress and parsley leaves. Flake the trout flesh into the salad. You can chop the crisped skin into the salad also if you like. Serve with the remaining dressing on the side. Thank you to everyone who participated in or supported the Fishwives project last October to celebrate trout, Ireland’s so-called “forgotten fish”. 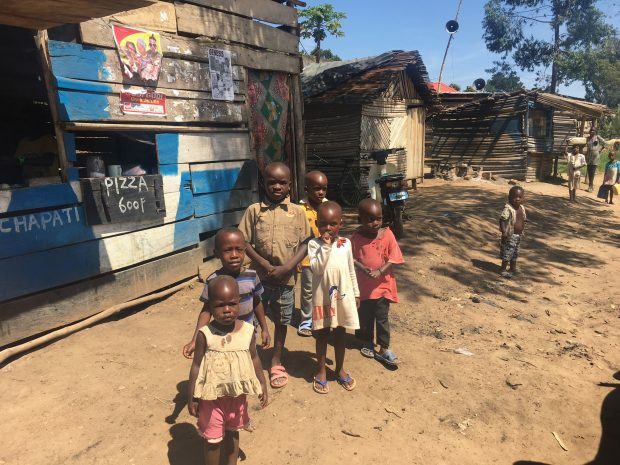 As you might already know, the proceeds are going to Hospice Africa Uganda (HAU), a charity that is helping thousands of sick and dying men, women and children in Africa, ensuring they have a pain-free, dignified death. The Fishwives idea came about because I was frustrated that so many fish cookery books did not include trout recipes. There is a false perception that trout is somewhat inferior to other fish such as salmon and cod. We, at Goatsbridge, have worked tirelessly to educate and promote what I believe is an amazing product so I sincerely hope that users of this exciting new book by now appreciate what a versatile, affordable and delicious fish trout is. It was an idea to celebrate not just trout but also the fantastic wealth of female talent we have in this country. 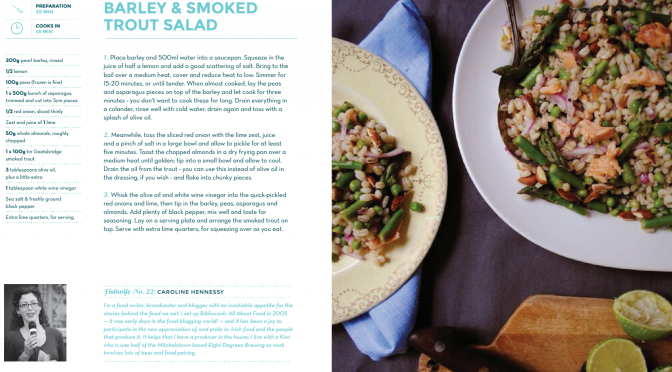 Recipes in the book, which are beautifully produced by Slater Design in Dublin, range from trout caviar cocktails to fish curries, pies and salads. I had good fun including my four sisters, Miriam, Louise, Joanne and Cathy, who all contributed recipes. 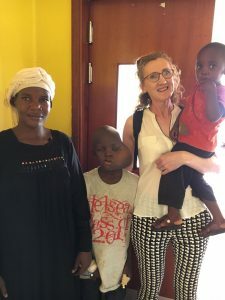 Miriam (Donohoe) volunteered with Hospice Africa Uganda in Kampala for eight months last year and I had the privilege to go out to visit the charity in March of this year to see for myself the tremendous work being carried out by The Hospice. That trip afforded me the opportunity to spend time with Dr Anne Merriman, an inspirational 81-year-old Nobel Peace Prize nominee who founded Hospice Africa Uganda in 1991. That trip is an experience I will carry with me to the end of my days. 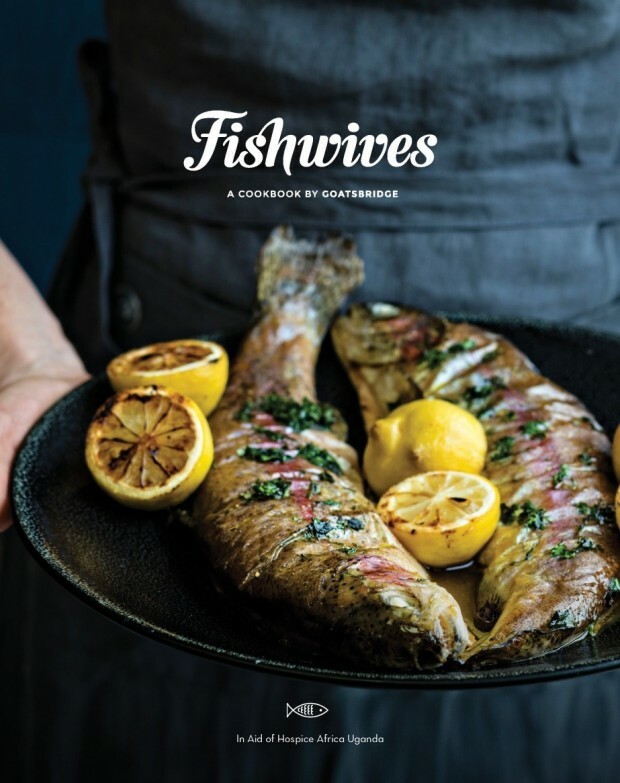 The good news is that ‘Fishwives’ has been nominated in two categories in the Cookbook Oscars – the prestigious Gourmand World Cook Awards and is set for global honours on the international stage in China on May 26th this year. With this in mind we are hoping to encourage as many retail outlets to stock the book and hopefully help us to achieve our ambitious target of book sales. Goatsbridge are taking no return on the sale of this book. We are giving every penny to The Hospice Movement. I am hoping you will agree to help us spread the word to sell the book. I am conscious many of you have your own charities to support so I completely understand constraints place on you to help us in our quest, so no pressure whatsoever. The books come in boxes of 10 and cost €20 and I am happy to send a copy of the book in advance if any of you need copies as samples. Just email me mag@goatsbridgetrout.ie or ring me on 086-8188340 if you can help or have any further questions. In the meantime, if you’d like to purchase your own copy of Fishwives, you can do so from our online shop and as an extra thank you, we’ll add a 125g pack of Goatsbridge Trout Pate to your order. We should not limit our challenges but challenge our limits. Earlier this year I challenged those around me to help put a recipe book together in four months and we luckily achieved our goal. The end result is a beautiful fish recipe book called Fishwives, available now in our online shop. All profits from the sale of the book will be going to the wonderful Hospice Africa working out in Uganda. They will be channeled through Hospice Africa Ireland, a board in Ireland which fund raises and supports Hospice Africa Uganda. See www.hospiceafrica.ie for more information. Looking back on it now I suggest it was interesting, and overcoming the challenge certainly made my life meaningful. I now look on to the next challenge and it is to ensure that every household in the country has a copy of this book under their tree this Christmas. I challenge you to help me make this a reality. 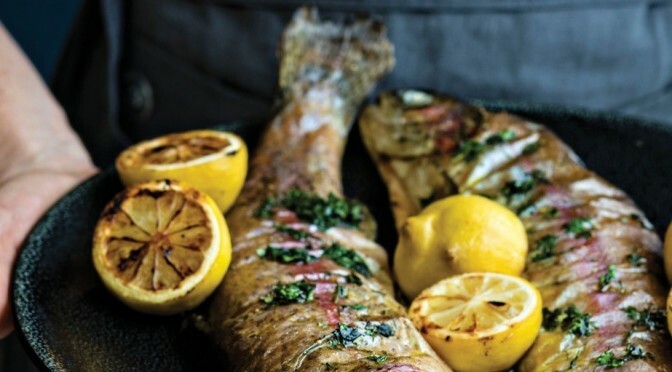 Why not have a Fishwives themed get together with friends and family, cook something from the book or simply encourage them to purchase the book on the night – a bit like a tuperware party only cooking with fish. Or perhaps you have a database of foodies or friends interested in cooking who might like a very special and unique book as a present. Would it help that all proceeds are going to a very worthy cause? We will give free product to anyone willing to put their shoulder to the wheel and our staff are happy to travel the length and breadth of the country to be part of your event. All ideas welcome. 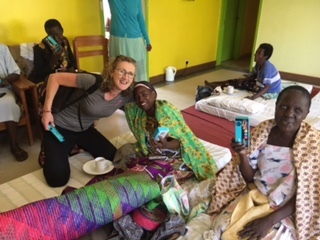 My sister Miriam Donohoe has spent 8 months on the ground in Kampala working with the hospice organisation and reported back first-hand the work being carried out daily to help relieve pain and suffering of those with no access to pain relief in their dying days . We are all weary of the bad media around so called charitable organisations but it does not mean we have to stop caring and become totally cynical. I know for sure where every single penny of the money raised form this project will go. Come on folks, life is not all about getting and having. How about giving and being?